Appeal not to buy official club merchandise (until stadium decision is made) was issued by Coventry City supporters trust. The group organised a protest on Saturday to keep their club at Ricoh Arena. BBC report. 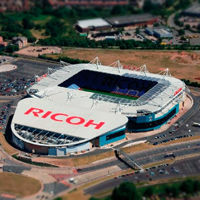 Some 100 supporters of Coventry City FC gathered in front of Ricoh Arena on Saturday to protest their club's announcement of possibly moving to a new purpose-built stadium outside of Coventry city limits. The opposition comes after troubled club didn't respond to Ricoh Arena's proposal to play there without rental fees in 2013/14 campaign. Trust spokesman Moz Baker said: "The clock's ticking all the time. There are no season tickets being sold - people need to know where we're playing and that should be in Coventry. "We have a perfectly good, purpose-built stadium here which we should be playing at."